We can use single object of the class throughout the lifetime of an application using singleton design pattern. To get a single object is by declaring a class, which contains only static methods. Then the static class is loaded into the memory when the program execution starts and still available until the application ends. If there is situation that we need only one instance of a class in a truly object oriented fashion by adhering to the basic principles of object oriented programming, the Singleton patterns are used. The Singletons are often used to control access to resources such as database connections or sockets. Suppose we have a license for only one connection for our database. 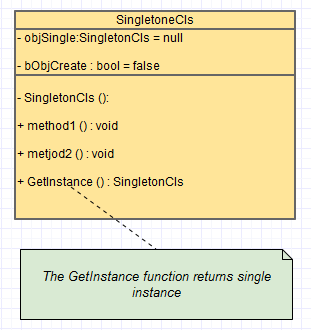 A Singleton connection object makes sure that only one connection can be made at any time. outFile << "[" <<currentTime.GetDay () << "-" << currentTime.GetMonth () << "-" << currentTime.GetYear () << " "
out_ << "[" <<currentTime.GetDay () << "-" << currentTime.GetMonth () << "-" << currentTime.GetYear () << " "
We have to remember that the Implementation of a singleton pattern must satisfy the single instance and global access principles. It also requires the feature that to access the singleton class member without creating a class object and a mechanism to persist the value of class members among class objects. The singleton pattern must carefully constructed in multi-threaded applications. If two threads are to execute the creation method at the same time when a singleton does not yet exist, they both must check for an instance of the singleton and then only one should create the new one.